**NEW TIME TRAVEL ALT. HISTORY FROM A MASTER: **Flint's Ring of Fire and Boundary series have proved him to be a master of time travel alternate history. Here then, a new tale of persons displaced in time, fighting for their lives. Now, the planet is struck with yet another such cataclysm, whose direct impact falls upon the *Queen of the Sea, *a cruise ship in the Caribbean. When the convulsions subside, the crew and passengers of the ship discover that they have arrived in a new and frightening world. That is the new world in which the *Queen of the Sea *finds itself. 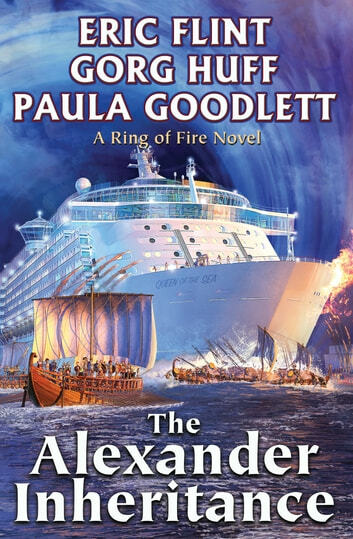 Can Marie Easley and Captain Lars Flodden guide the crew and passengers through this cataclysm? Fortunately, they have some help: a young Norwegian ship’s officer who forms an attachment to Alexander’s widow; a French officer who is a champion pistol marksman; a canny Congressman from Utah—and, most of all, many people of the time who are drawn to a vision of the better world of the future.